Shakira opened the pre-order window for her imminent studio album El Dorado,the most eagerly anticipated superstar release of the year. The 13-song El Dorado will be available worldwide on May 26. It also marks the premiere for her video "Me Enamoré" which the artist co-directed with Jaume de Laiguana. According to Colombian legend, the golden city of El Dorado held invaluable treasures - and many spent years searching for them. In that spirit, Shakirahas hidden treasures around the Globe. Yesterday fans in six continents participated to piece together the tracklisting for the upcoming album in a matter of hours in over 900 locations. So far, this album has spun off four massive hits. The fun started with "La Bicicleta" (The Bicycle), a shimmering fusion of urban and Colombian vallenato music in collaboration with Carlos Vives. This song spent 25 big weeks at #1 on the Billboard "Latin Airplay" chart and was certified 5x Platinum in Spain. It was followed up by the seductive track "Chantaje" (Blackmail) feat. Maluma. With over 1.1 billion views on YouTube, it is one of the platform¹s biggest Latin hits in history. It also reached #1 on the "Latin Airplay" chart and was certified Double Platinum in Spain. Delighting her followers with the sensual bachata rhythm, she then released the single ³Deja vu² feat. Prince Royce, which hit #1 on the Billboard "Tropical Songs" chart. Her latest hit "Me Enamoré" (I Fell in Love), which tells her love story with Spanish soccer star Gerard Piqué, has quickly become another hit sitting in the Top 5 of Billboard¹s "Latin Pop Songs" chart. Other tracks on this album include "Nada" (Nothing); "Amarillo" (Yellow); "Perro Fiel" (Lap Dog) feat. Nicky Jam; "Trap" feat. Maluma; "Comme Moi" (Like Me) feat. French artist Black M; and "Toneladas" (Tons). 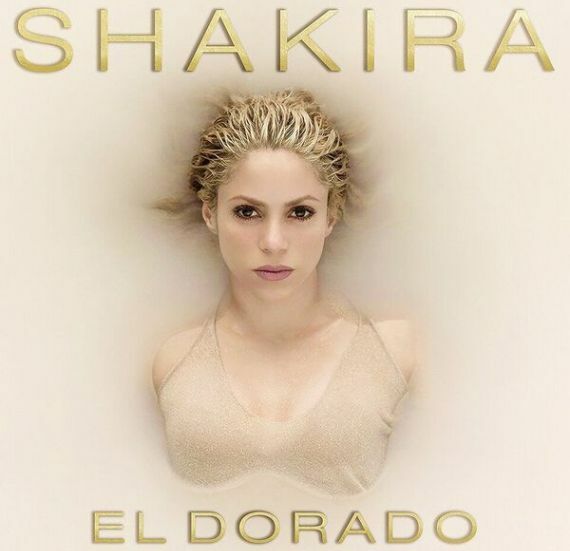 El Dorado also has three songs in English: "When a Woman," "Coconut Tree" and "What WeSaid" feat. Canadian band Magic!. The album's cover art was created by Jaume de Laiguana, a longtime collaborator of Shakira and the director of her music videos "La Bicicleta" and "Chantaje." El Dorado is her first Spanish-language album since Sale el Sol (2010) and her first studio album since her self-titled 2014 LP. Shakira adds to her rich musical legacy with El Dorado and reaffirms her status as a global icon. Over the course of her career, Colombian singer-songwriter and GRAMMY® winner Shakira has sold over 60 million records worldwide and has won numerous awards including two GRAMMY's®, eight Latin GRAMMY's®, and several World Music Awards, American Music Awards and Billboard Music Awards, to name a few. She is the only artist from South America to have a number one song in the US, and has had four of the 20 top-selling hits of the last decade. At the age of 18, she founded the Pies Descalzos (Barefoot) Foundation which currently provides education and nutrition to over six thousand impoverished children in Colombia and is expanding its work to other countries, including newly launched projects in Haiti and South Africa. In October 2011, Shakira was named a member of President Obama¹s Advisory Commission on Educational Excellence for Hispanics. Shakira served as coach on the 4th and 6th season of "The Voice," NBC's hit reality vocal competition series that searches for the nation's best voice. Her tenth studio album ³Shakira² was released in 2014, featuring hits such as "Can't Remember to Forget You," with Rihanna and "La La La (Brazil 2014)" which sheperformed at the finals of Fifa's World Cup 2014 in Brazil. In 2016, she starred as Gazelle in Disney's record-breaking film "Zootopia," as well as contributing to its soundtrack with "Try Everything". In June, she launched "La Bicicleta" with fellow Colombian artist Carlos Vives, which broke records in Colombia when it remained #1 for 18 consecutive weeks and spent 13 weeks at #1 in Spain, as well as reaching #1 on US Latin iTunes. The video, shot in Shakira and Carlos's hometowns of Barranquilla and Santa Marta, respectively, has over 900 million views on Vevo to date. It was followed up by the seductive track "Chantaje" (Blackmail) feat. Maluma. Withover 1.1 billion views on YouTube, it is one of the platform¹s biggest Latinhits in history. It also reached #1 on the "Latin Airplay" chart and was certified Double Platinum in Spain.